The horsepower rating should be a good way of determining what size of compressor you need, but unfortunately, the marketing guys have been exaggerating horsepower ratings to help the big-box stores sell more compressors. Industrial compressors are usually accurately rated, which is why an industrial 5 HP compressor is usually about three times as big and expensive as an overrated hobby-type 5 HP compressor. One way to tell if you are looking at real or overrated HP is to look at how much electrical power it takes to run it. A true 5 HP motor will draw about 24 amps on a 220 volt circuit (single phase power), whereas most overrated hobby compressors will run on a normal 15 amp 110 volt circuit, which is only capable of running about 2 real HP. If you can plug it into a normal wall plug, it can’t be more than 2 real HP. Gas engine HP is rated differently than electric motor HP. For example, it would take a 10 HP gas compressor to produce as much air as an industrial 5 HP electric compressor. Air pressure is usually rated in pounds per square inch or PSI. Most air tools require 90 PSI to run properly, but to maintain 90 PSI at the tool, you need a compressor with a higher shut-off pressure. Many industrial compressors are two-stage, which means they build up to shut-off pressure in two stages. The first stage builds to about 90 PSI and the second stage builds to 175 PSI. 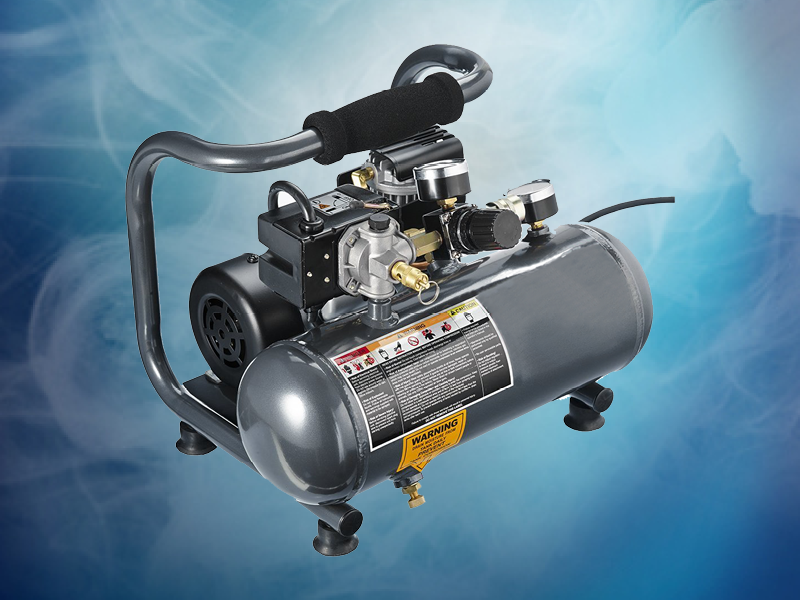 Most hobby and smaller commercial duty compressors are single stage and shut off at 125 – 135 PSI. This sounds like plenty of air pressure, but they usually kick in at about 100 PSI, and when you consider the pressure drop caused by restrictions in the hose and couplers, you might not have enough pressure at the tool. Air tools require a certain volume of air to keep them going. The volume of air that a compressor produces is rated in cubic feet per minute (CFM). You may see several CFM ratings at different pressures on a compressor. Sometimes you’ll see a high rating for displacement CFM, which is a calculated rating based on the size and speed of the compressor pump. This rating doesn’t mean much because it’s at zero pressure and does not consider the inefficiencies of the pump. The most important CFM rating on smaller compressors is at 90 PSI because that is the pressure required to run most tools. CFM ratings tend to be exaggerated just like HP ratings, but you should get 3-4 CFM per real HP at 90 PSI. Does size matter? The answer is not too much. A compressor tank doesn’t produce air. It only stores air. It is much more important to have a big enough pump and motor, because if you are producing as much air as you want to use, you’ll never run out of air, no matter how small the tank is. 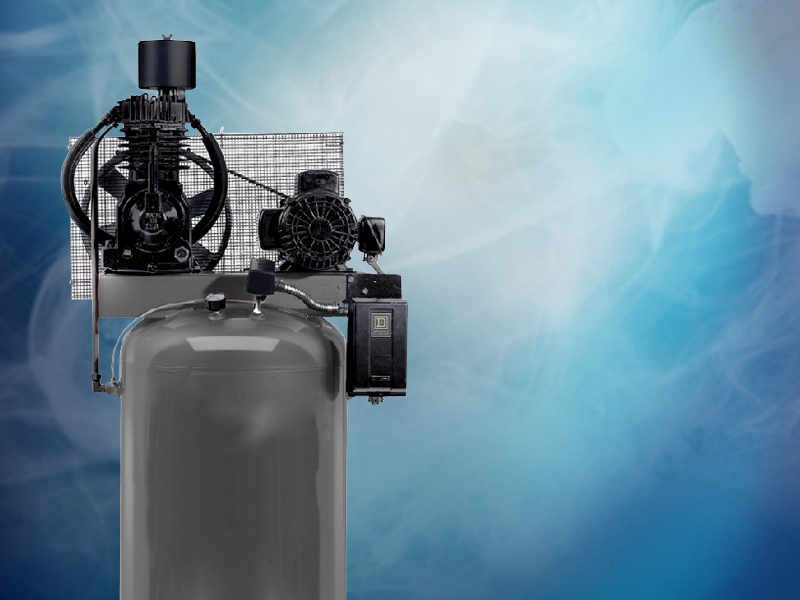 However, there are some situations where you can save money by getting a smaller compressor with a large tank if you only use air intermittently. For example, if you have a compressor that produces 10 CFM continuously, you can take 20 CFM out of the tank for half the time. If you need to run a 1″ impact wrench (about 20 CFM) intermittently, and have a small compressor with a large tank, you might have enough air stored in the tank to do the job. This way the compressor can build pressure until you need to repeat the job. On the other hand, if you want to run a tool steady, such as a sander, it is important to be producing as much air as you need. A smaller tank is more portable and gets up to pressure quicker, whereas a compressor with a large tank doesn’t start and stop as often and cools the air a bit better. A large tank doesn’t mean the compressor runs less; it starts and stops less often, but the running time is the same as if it had a smaller tank. Tank sizes are usually measured in US gallons. Or return to top of page. Single-stage compressors have one or more cylinder, and each cylinder pumps air directly into the tank. Two-stage compressors have at least two cylinders, and the air is pumped from one cylinder into another and then into the tank. A typical two-stage, two-cylinder pump moves air through a cooling tube and into the smaller second-stage cylinder at about 90 PSI, and finally into the tank at 175 PSI. The main reason for buying a two-stage compressor is if you need high pressure, but not too many applications need high pressure. Therefore, you probably don’t need a two-stage compressor. Some people believe that a two-stage compressor is better quality than a single-stage compressor, but that is not necessarily true. I’ve seen good and poor quality compressors in both single and two-stage. However, most 5 HP and larger industrial compressors are two stage and they are better doe to the fact they are built to industrial standards, not because they are two stage. For most applications, you would be better off with a good quality single-stage compressor instead of a low-cost big-box store type two-stage compressor. There are some very good compressors in both belt drive and direct drive versions. The problem is that most of the direct-drive compressors you’ll see were designed to keep the cost down for the big-box stores, and of course that also means low quality. Direct-drive compressors are directly connected to the motor shaft and therefore turn the same speed as the motor, which typically spins either 1,725 or 3,450 RPM. There are a few exceptions, but most decent quality direct drive compressors are low RPM. Engineers have designed some compressors to spin twice as fast so they could get more air out of them and keep the price low for the big-box stores. But the life expectancy is cut down to about one quarter of that of a low RPM compressor, and the noise is almost unbearable. A few manufacturers still make low RPM direct-drive compressors in smaller sizes and they are excellent for finishing carpenters and other applications where portability and quietness is important. Some direct-drive compressors are oil-less, which is necessary in some applications such as breathing air or aeration. If they are low RPM and designed right, they’ll last a long time, but you’re better off staying away from a high-speed oil-less compressor. There are a few European manufacturers who make some high-quality direct-drive oil-lubricated compressors. They are compact and portable and are ideal for the construction industry. In the last few years there have been many Chinese copies of these European compressors. Just like other tools that are copied, some are good and some are not. If you don’t need to carry the compressor around or if you need higher air volume, your best value will be in belt-drive oil-lubricated compressors. You still have to be careful because there are some high-speed aluminum pumps with very low life expectancies that were built for low price, just like some of the direct-drive compressors. The main advantage of belt-drive compressors is that the pump can spin a lot slower than the motor, which allows it to be more efficient with a lot less wear and tear. Most belt-drive compressors are splash lubricated, which means they have dippers on the bottom of the connecting rods to splash oil around in the compressor crankcase. As long as there is enough oil in the crankcase, splash-lubricated pumps should last a long time. For best value, get a belt-drive, oil-lubricated compressor (unless you need to carry it around) and stay away from the noisy high-speed, oil-less compressors. Knowing the duty cycle is very important before you buy a compressor. The duty cycle is expressed as a percentage and tells you the number of minutes the compressor is allowed to run out of a 10 minute period. For example, a low-quality hobby compressor usually has a 50% duty cycle, which means it shouldn’t run more than 5 minutes out of any 10 minute period. If you exceed the duty cycle, the pump will get too hot and won’t last as long as it should. Most industrial compressors have at least a 75% duty cycle and some are as high as 100%, which means you can run them continuously. Here’s how a better duty cycle can help you. You and your buddy each have to paint a barn with a 10 CFM compressor. If your compressor has a 65% duty cycle and his has only a 50% duty cycle, you would get 30% more of your barn painted in a day. Assuming both your spray guns require 10 CFM, your buddy could paint for only 5 minutes and then would have to wait for 5 minutes. Whereas you could paint for 6 1/2 minutes and wait for only 3 1/2 before you start painting again. That’s a 30% increase. In another example, a super-duty 5 HP compressor with a 100% duty cycle can actually produce more continuous air than a heavy-duty 7.5 HP compressor with a typical 75% duty cycle. You will usually get better value by spending a little more money to get a compressor with a longer duty cycle. When you compress air it gets hot, and when it cools, water condenses out of it. The harder you work your compressor, the hotter it will get and the more moisture problems you will have. Sometimes the best way to solve moisture problems is to get a bigger compressor so it doesn’t have to work as hard and get so hot. The humidity in the air can also cause you to have inconsistent moisture problems. A common moisture trap provides a low spot for water to collect. This system is designed to collect droplets of water, not water vapor, so if the air is hot it will carry moisture through, and then the water vapor will condense in the hose. The trick is to get the air as cool as possible before it gets to the moisture trap, because if it cools after the trap, more moisture will condense out. In a body shop or industrial application you will usually use refrigerated air dryers to cool the air and remove the moisture. Desiccant dryers are another way to remove moisture. They use silica gel to absorb moisture from the air, and the silica gel can be replaced or heated when saturated. If you have a smaller system, you may get by with a well thought out plumbing system. Copper or aluminum pipe won’t rust and both dissipate heat well. If you use a larger size it will work like a bigger radiator and cool the air even better. Remember to mount the moisture trap at the end of the pipe, as far from the compressor and as close to the equipment as possible. A common misconception is that you’ll reduce the water in your air lines by draining your tank often. It is important to drain your tank to prevent rust, but the water in the bottom of your tank isn’t likely to get into your air lines. As a matter of fact, if you were to fill your tank half full with cold water, the air would cool, moisture would condense out and you would have dryer air in your lines. That doesn’t mean that you should put water in your tank, but you should do everything you can to cool the air before it gets to your moisture trap. What if you save 10-20% by buying your compressor at the local big-box store or by buying an economy industrial compressor and it lasts only half as long as another compressor? Have you really saved money? Some brands of contractor’s compressors are designed to last 10 times as long as others and usually there is very little difference in the price. Don’t buy a compressor unless the dealer can tell you about the life expectancy. If he doesn’t know, get him to call the manufacturer. As a rule of thumb, for every dollar you spend to get a better or bigger compressor, you’ll probably save 2-3 dollars in the long run. Besides purchasing a high-quality compressor to get long life expectancy, you can also buy a bigger compressor. For example, if a 10 HP compressor is the minimum size required for your application, get a 15 HP compressor because it will run about 2/3 as much and will stay a lot cooler, so it might last twice as long. When you buy a compressor, consider how much it costs per hour of life expectancy. How Big of a Compressor Do I Need? Of the thousands of compressors I’ve sold, I haven’t yet had a customer come back saying they wish they had bought a smaller compressor. If you’re running industrial equipment you’ll have to go by the manufacturer’s specifications. Most automotive air tools require about 10 CFM at 90 psi to keep them going. However, impacts and ratchets, etc., are usually run intermittently, so if you have 5 CFM per tool available continuously you’ll probably be fine. On the other hand, if you want run sanders or other tools that you’ll run steadily, you’ll need at least 10 CFM per tool continuously. For example, if you want to run a sander steadily you could get a 16 CFM (at 90 PSI) compressor with a 65% duty cycle, which would give you just over 10 CFM continuously. With a typical sander, you wouldn’t have to wait for air nor would you have to worry about overworking the compressor. If you have a smaller compressor, you can still sand the car, but you’ll tend to overwork the compressor and you’ll be waiting for air. As a rule, you need about 2 1/2 real HP for each automotive tool. Industrial air tools often require a lot more air than automotive tools so you should check the manufacturer’s specifications. Don’t make the mistake of buying a compressor that won’t run most of the 200 or so tools available because once you start using air tools you’ll like them. Most of this information pertains to electric reciprocating compressors. 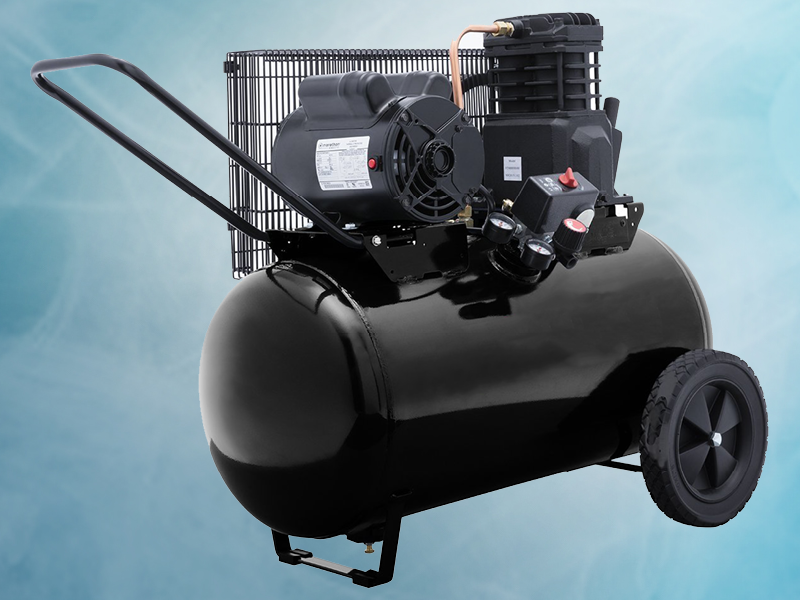 If you need 25 HP or more you should consider a screw-type compressor. If you need a continuous low volume, low pressure supply, you should consider a diaphragm compressor. There are several other types, like the rotary vane and regenerative blowers that are excellent for certain applications, but reciprocating piston-type compressors are the most common, and are best value for most applications. 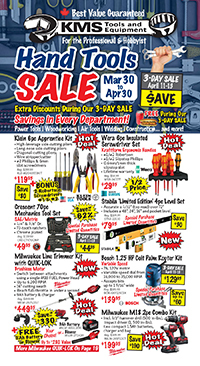 Don’t buy a compressor until you talk to the experts at KMS Tools. We’ve done the homework and can help you choose the compressor that’s best for the type of work you are doing, whether it be on the job site, at a heavy-duty industrial shop or at home. We carry quality compressors made in the USA, plus a few low-end models to compete with the big-box retailers. Check out our Air Compressor Department today! This entry was posted in Air Compressors, Archives, Buying Guides, Shop Equipment and tagged Belt Drive, CFM, Compressors, Direct Drive, Duty Cycle, HP, PSI by Your Friends in the Tool Business. Bookmark the permalink. ← Previous Previous post: KMS Coquitlam Annual Show & Shine 2015 – Celebrating 20 Years!